Conflicts in documentary evidence happen all the time. The logical resolution of such conflicts is one of the hallmarks of sound genealogical research that separates the professionals and experienced family history researchers from the novices. A perfect illustration of this is the story of my great-great-grandfather, Józef Grzesiak, and his many (?) wives. Growing up, I used to ask my maternal grandmother to tell me about her mother’s family in Poland, and my desire to document those stories inspired my early family history efforts. Grandma’s mother was Veronica (née Grzesiak) Zazycki, but Grandma never knew the names of her grandparents, because “people didn’t talk about those things back then,” as she told me time and again. Nevertheless, Grandma knew a few details, such as the fact that her mother’s parents owned the grain mill that I wrote about previously. She told the story of how “Veronica’s mother died when Josephine was born, so at age 18, Veronica came to America. She found employment working in the kitchen of a restaurant. She spoke no English, so her employers called her Mary and they communicated through signs and gestures. She saved her money and sent it to her two brothers, Władysław (“Walter”) and Tadeusz, (Thaddeus), and her sister Józefa (Josephine), so they could come to America.”1 Grandma also told the story, shared previously, of how Walter married an actress in Poland who didn’t want to leave her career, which ultimately ended their marriage. Now this was interesting, and it seemed like just the kind of detail that those family stories were likely to gloss over, since “people never talked about these things back then.” Okay, I concluded, no big deal, apparently Veronica and Thaddeus were half-siblings, sharing a father, but different mothers. On this document, Walter was reported to be the son of Joseph Grzesiak and Maryanna Szafron. Now, most genealogists consider death records to be less accurate sources for information about an individual than some other types of records (e.g. marriage records) since the informant is probably grieving, possibly in shock, and may not be well-informed about the early life of the decedent, including parents’ names. However, in this case, the informant was none other than Thaddeus (signing himself here as Theodore) Grzesiak — Walter’s brother. So what do we make of this? We have four siblings, all children of Joseph Grzesiak, but four different mother’s names reported on four different documents by three of the siblings. Were they all half-siblings, each with the same father but a different mother? I ran this theory past Grandma while she was still alive, and she didn’t buy it. She had never heard of Walter, Thaddeus and Josephine being half-siblings to her mother, but she had no explanation for the discrepancies on the documents. The maiden names reported for the mothers — Marianna Krawczyńska, Marianna Szafron, Marya Cebulska, and Anna Nowacka — weren’t even phonetically similar, apart from the fact that the siblings more or less agreed on a first name of Marianna. And was it grief that caused Thaddeus to change his story, reporting on his own marriage record that his mother was Maria Cebulska but then deciding 36 years later that her name was Marianna Szafron? Was it possible that the Grzesiak siblings did not even know their own mother’s name? Perhaps there was an explanation: Grandma said that Veronica’s mother had died (shortly?) after the birth of the youngest sibling, Josephine. Since Thaddeus and Veronica were only 7 and 5 when Josephine was born, maybe none of the children knew her well? The only way to answer this question was to examine evidence from Polish records. The birth records for Walter, Veronica, Thaddeus and Josephine should tell us who their mothers were. If Joseph had several wives who died in succession, there would be death records for those wives and marriage records to tell the tale. A very robust paper trail consisting of naturalization records (Figure 5),6 passenger manifests,7,8 and draft registrations,9 in addition to a personal recollection shared with me by Tadeusz Grzesiak’s son, Arthur Gray,10 all pointed to the Grzesiaks’ place of origin as the village of Kowalewo-Opactwo in Słupca County, which was at that time located in the Kalisz gubernia (province) of Russian Poland. Figure 5: Władysław Grzesiak’s petition for naturalization, 23 January 1917, showing place of birth “Kowalewo, Poland, Russia” on 17 September 1867. It’s evident that there’s a language change between these two records. Władysław’s birth record was written in Polish, while Tadeusz’s birth record was written in Russian. This was one of the punitive measures imposed by the Russian Government on Polish territories as a result of the failure of the January Uprising of 1863. Prior to 1867, the use of the Polish language was permitted in official record-keeping, but starting in 1868 (earlier in some areas) official records and even church records were required to be kept only in Russian. Tadeusz’s birth date, 27 March 1874, is a few years off from his date of birth as he reported it on his World War II draft registration — 24 March 1878. However, it was not unusual for people to report their dates of birth inaccurately in an era when there was no reason to know this information precisely, as there is today. In this document, Józef Grzesiak was reported to be a 33-year-old “master of the house” (хозяин), while his wife, Marianna, was age 31. The age difference between Józef and Marianna, which was 6 years in the first record, has magically diminished to 2 years, but again, such discrepancies are very common in these records. Once again, parents were recorded as Józef Grzesiak, “master of the house,” of Kowalewo, age 37, and his wife, Maryanna née Krawczyńska, age 33. Finally, the birth record of Józefa Grzesiak was discovered.14 Józefa was born 6 March 1881, and yes, her parents were none other than Józef Grzesiak and Marianna née Krawczyńska (Figure 9). This time, Józef Grzesiak was recorded as “master of the house,” age 40, while his wife, Marianna, was age 37. Ultimately, Józef’s and Marianna’s dates of birth can only be known accurately when their birth records are discovered — and I discovered those a long time ago, but that’s another story for another day. The fact that this is the only marriage record found for Józef Grzesiak in Kowalewo is unsurprising, given that all of his children’s birth records name the same mother, Marianna Krawczyńska. The date of the record makes sense — they were married about 2 years before Władysław’s birth in 1867, not an unusually long period of time to be married prior to the birth of an eldest child. Józef was described as a 25-year-old bachelor, born in Cienin Zaborny but residing in Kowalewo with his parents, Stanisław and Jadwiga, at the time of his marriage. Marianna was noted to be age 22, born in Zagórów and residing in Kowalewo, daughter of Antoni and Wiktoria. So at the end of the day, there is absolutely no evidence in Polish records for any wives of Józef Grzesiak other than Marianna Krawczyńska, whom he married in 1865 and with whom he had 6 children: the four immigrant Grzesiak siblings, as well as two daughters, Konstancja and Pelagia, who remained in Poland, and whose story I touched on a bit previously. There was no Maria Cebulska, no Anna Nowacka, no Marianna Szafron. They didn’t exist. Grandma Veronica was the only one of her siblings who accurately reported her mother’s name on a document in the U.S. So where did Tadeusz and Józefa come up with those names? Maybe Grandma was right all along — “people just didn’t talk about those things back then.” Maybe Tadeusz and Józefa really had no idea what their mother’s name was. One thing is certain, though: Marianna Grzesiak did not die when Józefa was born, or even shortly thereafter. No, Marianna Grzesiak died in Russian Poland in 1904, when her youngest daughter Józefa was 23 years old and married.16 So isn’t it a little odd that at least two of her children didn’t appear to know her name, and that the story was handed down that she died before Veronica and her siblings left Poland for America? I have some speculations about that, but it’s another story for another day. Genealogists usually find that the best strategy for handling conflicting evidence is to keep gathering data until the truth emerges. Sometimes some analytical skill is required to interpret the data, but at other times, it’s just a question of perseverance to find the right records to settle the question. In this case, one could look at the data from U.S. records and conclude that Józef Grzesiak had three or four wives, or one could dig deeper, find the Grzesiak children’s birth records and Józef and Marianna’s marriage record from Poland, and know the truth. 1 Helen Zielinski, interviews by Julie Szczepankiewicz, circa 1986-1998; Notes from interviews privately held by Julie Szczepankiewicz, Hopkinton, Massachusetts, 2018. 2 City of Buffalo, Bureau of Vital Statistics, marriage record for John Zazycki and Veronica Grzesiak, 5 August 1901, certificate no. 202, Buffalo, Erie, New York, Erie County Clerk’s Office, 92 Franklin Street, Buffalo, New York. 3 New York State Department of Health, Bureau of Vital Statistics, marriage record for Thaddeus Grzesiak and Mayme (Mary) Gorski, 20 April 1910, certificate no. 9051, Buffalo, Erie, New York, Erie County Clerk’s Office, 92 Franklin Street, Buffalo, New York. 4 City of Buffalo, Bureau of Vital Statistics, marriage record for Joseph Cymerman and Josephine Grzesiak, 5 August 1902, certificate no.198, Buffalo, Erie, New York, Erie County Clerk’s Office, 92 Franklin Street, Buffalo, New York. 5 New York, Department of Health, Division of Vital Statistics, death certificate for Walter Grzesiak, 25 April 1946, no. 2600, Buffalo, Erie, New York. 6 Wladyslaw Grzesiak, Petition for Naturalization, No. 4950, 23 January 1917, Supreme Court of New York, Buffalo, Erie, New York. 7 Maryland, Baltimore Passenger Lists, 1820-1948 (image), Veronika Grzesiak, S.S. Willehad, April 1898, https://www.familysearch.org, accessed 25 February 2018. 8 Maryland, Baltimore Passenger Lists, 1820-1948 (image), Jozef, Kazimira and Jozefa Grzesiak, S.S. Rhein, May 1900, https://www.familysearch.org, accessed 25 February 2018. 9 World War II Draft Registration Cards, 1942, Draft Registration Cards for Fourth Registration for New York State, 04/27/1942 – 04/27/1942; NAI Number: 2555973; record Group Title: Records of the Selective Service System; Record Group Number: 147, record for Tadeusz George Grzesiak, http://ancestry.com, subscription database, accessed 25 February 2018. 10Arthur Gray, interview by Julie Szczepankiewicz, circa 1998; Notes from interview privately held by Julie Szczepankiewicz, Hopkinton, Massachusetts, 2018. 11 Akta stanu cywilnego Parafii Rzymskokatolickiej Kowalewo-Opactwo (Kowalewo-Opactwo, Słupca, Wielkopolskie, Poland), Księga urodzeń, małżeństw, i zgonów, 1867, births, #39, record for Władysław Grzesiak, accessed in person at the archive by Zbigniew Krawczyński, Archiwum Państwowe w Poznaniu. Oddział w Koninie, 3 Maja 78 Konin, Poland. 12 Akta stanu cywilnego Parafii Rzymskokatolickiej Kowalewo-Opactwo (pow. slupecki), Księga urodzeń, małżeństw, i zgonów, 1874, births, #17, record for Tadeusz Grzesiak, Narodowego Archiwum Cyfrowego, Naczelnej Dyrekcji Archiwów Panstwowych, Szukajwarchiwach, http://www.szukajwarchiwach.pl, accessed on 25 February 2018. 13Akta stanu cywilnego Parafii Rzymskokatolickiej Kowalewo-Opactwo (pow. slupecki), Księga urodzeń, małżeństw, i zgonów, 1876, births # 72, record for Weronika Grzesiak, accessed on 25 February 2018. 14 Akta stanu cywilnego Parafii Rzymskokatolickiej Kowalewo-Opactwo (pow. slupecki) (Kowalewo-Opactwo, Słupca, Wielkopolskie, Poland), Księga urodzeń, małżeństw, i zgonów, 1881, births, #15, record for Józefa Grzesiak, Narodowego Archiwum Cyfrowego, Naczelnej Dyrekcji Archiwów Panstwowych, Szukajwarchiwach, http://www.szukajwarchiwach.pl, accessed on 25 February 2018. 15Akta stanu cywilnego Parafii Rzymskokatolickiej Kowalewo-Opactwo (pow. slupecki), Księga urodzeń, małżeństw, i zgonów, 1865, marriages, #10, record for Józef Grzesiak and Maryanna Kawczynska, 31 October 1865, Narodowego Archiwum Cyfrowego, Naczelnej Dyrekcji Archiwów Panstwowych, Szukajwarchiwach, http://www.szukajwarchiwach.pl , image 20.jpg, accessed on 25 February 2018. 16 Roman Catholic church, Zagórów parish (Zagórów, Słupca, Wielkopolskie, Poland), Kopie księg metrykalnych, 1808-1947, Akta zgonów 1891-1906, 1904, #52, death record for Marianna Grzesiak, DGS 8018016, Image 383, accessed on 25 February 2018. Where Were Your Ancestors in 1857? Genealogists often think in terms of family timelines, tracing one particular family line through many generations. However, it occurred to me that it might be interesting to examine my family tree in cross section. That is, what was happening in each of my family lines in the year 1857? I chose that year because I wrote recently about my 3x-great-grandparents’s marriage in Roding, Bavaria in 1857, and that got me wondering what my other ancestors were doing in that same year, and where they were living around the world. It turns out this is a pretty useful (and fun!) exercise. I gained new insights into each family group, and it also served to point out deficiencies in my research, and families that I’ve neglected, that I should perhaps plan to spend more time on in 2018. Here, then, is a summary of my ancestral couples who were alive at that time. Although the map in the featured image is not “clickable,” you can use this link to explore that map in greater depth, if you’d like. In the south of Poland in 1857, my 3x-great-grandparents on my Klaus line had not yet married. Jakub Klaus was the son of Wawrzyniec (Lawrence) Klaus and Anna Żala or Żola. He was a young man already 27 years of age, but he did not marry his wife, Franciszka, until 1860.3 Franciszka Liguz was the daughter of Wawrzyniec Liguz and Małgorzata Warzecha, age 21 in 1857. Both Franciszka and her husband-to-be, Jakub, lived in the village of Maniów in Dąbrowa County in the Galicia region of the Austrian Empire, and Jakub was described as a famulus, or servant. Still further south in what is now Poland, my 3x-great-grandparents Jakub Łącki and Anna Ptaszkiewicz were 4 years away from their eventual wedding date.4 In 1857, Jakub was a 22-year-old shoemaker from the village of Kołaczyce in Jasło County in the Austrian Empire, and Anna was the 23-year-old daughter of a shoemaker from the same village. Heading further north again in Poland, back into Sochaczew County in Russian Poland, my 2x-great-grandparents Ignacy and Antonina (née Naciążek) Zarzycki were about 8 years into their marriage, raising their family in the village of Bronisławy. By 1857, they had three children for whom birth records have been discovered, Marianna,5 Paulina,6 and Tomasz.7 Ignacy was a land-owning farmer who was born in the nearby village of Szwarocin,8 but his wife Antonina’s place of birth remains a mystery. In the nearby town of Zagórów, my 3x-great-grandmother, Wiktoria (née Dębowska) Krawczyńska was living as a 53-year-old widow, having lost her husband Antoni Krawczyński 10 years earlier.10 Antoni had been a shoemaker, and he and Wiktoria were the parents of 8 children, of whom 4 died in infancy. By 1857, the surviving children ranged in age from 27 to 14 — the youngest being my great-great-grandmother, Marianna Krawczyńska. Meanwhile, in Detroit, Michigan, my 3x-great-grandparents Michael Ruppert and Maria Magdalena Causin were newlyweds in 1857, having married on 12 May of that year.11 Michael had immigrated to the U.S. just four years earlier, at the age of 19, with his parents and siblings.12 The Rupperts were from the village of Heßloch in the Grand Duchy of Hesse-Darmstadt, or what is now Alzey-Worms district in Rhineland-Palatinate, Germany.13 Michael was a carpenter, and he and his family had already begun to use the surname Roberts.14 His wife Maria Magdalena Causin/Casin/Curzon is a bit of a mystery, and will likely be the subject of future blog post, because she doesn’t show up in the records until her marriage in 1857, and her parents’ names are not on her marriage or death records. In 1857, my 3x-great-grandparents Henry and Catherine (née Grentzinger) Wagner and were also living in Detroit, had been married for 2 years and were parents to their first child, John Wagner.15 Henry was a teamster who had arrived in Detroit about 3 years previously along with his parents and siblings, all immigrants from the village of Roßdorf in the Electorate of Hesse, a state within the German Confederation.16 This was a first marriage for Henry, but a second marriage for Catherine, since she was a young widow after the death of her first husband, Victor Dellinger or Dalmgher.17 In addition to burying her husband some time between 1850-1855, it appears that both of Catherine’s children from that first marriage 18 also died young, since they were not mentioned in the 1860 census in the household of Henry and Catherine Wagner. Catherine herself was an immigrant from Steinsoultz, Haut-Rhin, Alsace, who came to Detroit with her parents and siblings some time between 1830 and 1834. Across the border and some 225 miles to the east, my 3x-great-grandparents Robert and Elizabeth (née Hodgkinson) Walsh made their home in St. Catharines, Ontario, Canada. In 1857, Elizabeth Walsh was a 39-year-old mother of 5, pregnant with her 6th child, Ellen, who was born in December of that year.19 Elizabeth was the granddaughter and great-granddaughter of United Empire Loyalists, so her family were among the first settlers in St. Catharines. Her husband, Robert Walsh, was a 49-year-old tailor from Ireland whose family origins have proven to be more elusive than his wife’s. Also living in St. Catharines were my 3x-great-grandparents, Robert and Catherine Dodds. In 1857, Robert was a 40-year-old immigrant from England, usually described as a laborer or farm laborer. Nothing is known about Robert’s family of origin. He married his wife, Catherine, circa 1840, and by 1857 they were the parents of three daughters and three sons.20 Catherine’s origins, and even her maiden name, are unclear. There is evidence that she was born circa 1818 in Martintown, Glengarry, Ontario to parents who were Scottish immigrants or of Scottish extraction, but no birth record or marriage record has yet been discovered for her. In October 1857, my 3x-great-grandparents Johann Meier and Anna Maria Urban were married in the parish church in Roding, Bavaria.26 Their first child, Johann Evangelista Meier, was born out of wedlock two years previously although the father was named on the baptismal record with a note that the child was subsequently legitimized. Johann and Anna Maria would go on to have a total of 10 children, 3 of whom migrated to Buffalo, New York. In 1857, my 4x-great-grandparents, Ulrich Götz or Goetz and Josephine Zinger, were living somewhere in Bavaria and raising their 4-year-old son, Carl Götz, who was my 3x-great-grandfather. Almost nothing is known of this family, including where they lived in Bavaria or the names of Carl’s siblings. Carl grew up to be the second husband of a much older wife, Julia Anna Bäumler, who was already 19 in 1857. Julia had at least one child from a previous relationship, a son, John George Bäumler, who was born in 1858. Julia and Carl married in Bavaria circa 1875, a development which may or may not have influenced John Bäumler’s decision to emigrate from Bavaria to Buffalo, New York in 1876.28 Julia gave birth to her only child with Carl, Anna Götz (my great-great-grandmother), in 1877, and the Götz family eventually followed John Bäumler to Buffalo in 1883. Julia Götz’s death record states that she was born in “Schlattine, Bavaria,” which suggests the village of Schlattein in Neustadt an der Waldnaab, Bavaria, but further research is needed to confirm this location. So there you have it: a summary of where my ancestors were in the world, and in their lives, in the year 1857. But what about your ancestors? Where were they living, and what were they doing? Is there a more interesting year for your family than 1857? Choose a different year, and tell me your ancestors’ stories! 1 Akta stanu cywilnego parafii rzymskokatolickiej w Mistrzewicach, Polskie Towarzystwo Genealogiczne, Metryki.genealodzy.pl, 1875, Małżeństwa, #2, record for Zofia Zielińska and Piotr Malinowski, accessed on 10 November 2017. 2 Akta stanu cywilnego parafii rzymskokatolickiej w Mlodzieszynie, Polskie Towarzystwo Genealogiczne, Metryki.genealodzy.pl, Księga zgonów 1889-1901, 1895, #59, death record for Wojciech Kalota, accessed on 10 November 2017. 3 Roman Catholic Church, St. Mary Magdalene parish (Szczucin, Dąbrowa, Małopolskie, Poland), Księgi metrykalne, 1786-1988, Akta małżeństw 1786-1988, Maniów, 1860, 16 September, marriage record for Jacobus Klaus and Francisca Liguz, Family History Library film # 1958428 Items 7-8. 4 Roman Catholic Church, St. Anne’s Parish (Kołaczyce, Jasło, Podkarpackie, Poland), Śluby, 1826-1889, Stare Kopie, 1861, #11, marriage record for Jacobus Łącki and Anna Ptaszkiewicz. 5 Roman Catholic Church, St. Bartholomew’s parish (Rybno, Sochaczew, Mazowieckie, Poland), Księga urodzeń 1845-1854, 1850, #48, baptismal record for Maryanna Zarzycka. 6 Roman Catholic Church, St. Bartholomew’s parish (Rybno, Sochaczew, Mazowieckie, Poland), Księga urodzeń 1845-1854, 1853, #60, baptismal record for Paulina Zarzycka. 7 Roman Catholic Church, St. Bartholomew’s Parish (Rybno, Sochaczew, Mazowieckie, Poland), Księga urodzeń, 1855-1862, 1856, #48, baptismal record for Tomasz Zarzecki. 8 Roman Catholic Church, St. Bartholomew’s Parish (Rybno, Sochaczew, Mazowieckie, Poland), 1828, #34, baptismal record for Ignacy Zarzycki. 9 Akta stanu cywilnego Parafii Rzymskokatolickiej Kowalewo-Opactwo (pow. słupecki), 1832, marriages, #14, record for Stanisław Grzesiak and Jadwiga Dąbrowska, Szukajwarchiwach, http://www.szukajwarchiwach.pl/, accessed 17 November 2017. 10 Roman Catholic Church, Zagórów parish (Zagórów (Słupca), Poznań, Poland), Kopie księg metrykalnych, 1808-1947, 1843, #137, death record for Antoni Krawczyński. ; FHL film #2162134, Item 1, Akta zgonów 1844-1849. 11 Roman Catholic Church, St. Joseph’s parish (Detroit, Wayne, Michigan, USA), “Marriages”, 1857, #15, marriage record for Michael Ruppert and Magdalena Causin. 12 New York, Passenger Lists, 1820-1957 (index and image), record for Franz, Catherine, Michael, Arnold, and Catherine Rupard, S.S. William Tell, arrived 4 March 1853, http://ancestry.com, subscription database, Microfilm Serial: M237, 1820-1897; Microfilm Roll: Roll 123; Line: 51; List Number: 146, accessed 17 November 2017. 13 Roman Catholic Church (Heßloch (Kr. Worms), Hesse, Germany), Kirchenbuch, 1715-1876, 1834, baptismal record for Michael Ruppert, FHL film #948719. 14 1860 U.S. Census (population schedule), Detroit, Wayne, Michigan, p. 142, Michael Roberts and Frank Roberts households, http://ancestry.com, subscription database, accessed 17 November 2017. 15 Michigan, County Marriages, 1820-1940, database, Church of Jesus Christ of Latter-Day Saints, FamilySearch, (https://familysearch.org), database with images, 1855, #11, record for Henry Wagner and Catherine Dellinger, accessed 17 November 2017. 16 New York, Passenger Lists, 1820-1957 (image and transcription), record for Henry, Cath., August, Johnny, Gertrude, and Marianne Wagner, S.S. Erbpring Luidrich August, arrived 29 September 1853 in New York, Microfilm Serial: M237, 1820-1897; Microfilm Roll: Roll 132; Line: 12; List Number: 1010, http://ancestry.com/, subscription database, accessed 17 November 2017. 17 Michigan, County Marriages, 1820-1940, (images and transcriptions), Wayne County, marriage certificates, 1842-1848, v. B, #1733, marriage record for Victor Dellinger and Catherine Grenzinger, 3 February 1846, FamilySearch, https://familysearch.org, accessed 17 November 2017. 18 1850 U.S. Federal Census (population schedule), Detroit, Wayne, Michigan, page 156B and 157, Victor Dalmgher household, http://ancestry.com, subscription database, accessed 17 November 2017. 19 Census of 1861, database, Library and Archives Canada, St. Catharines, Lincoln, Canada West (Ontario), Robert Walsh household, item number 2721097, accessed 17 November 2017. 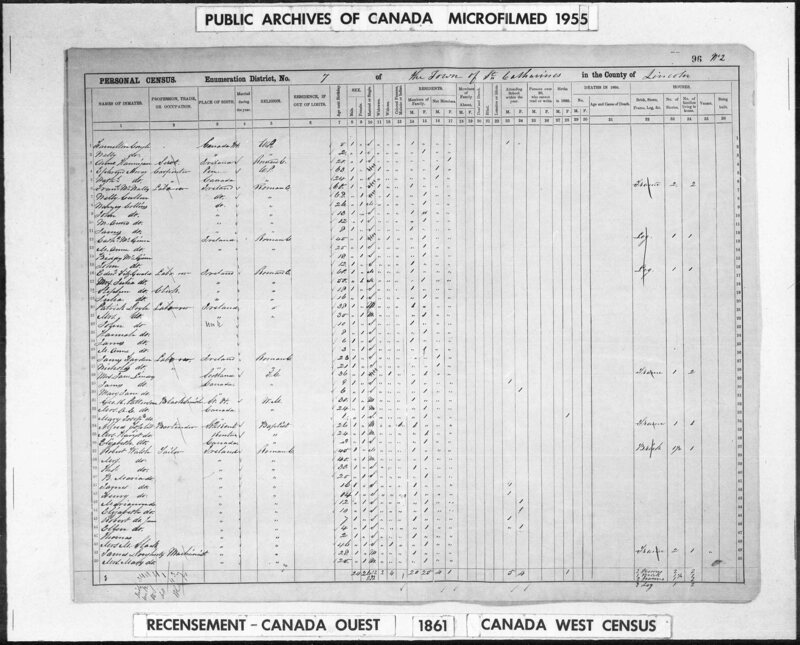 20 Census of 1861, database, Library and Archives Canada, Grantham, Lincoln, Canada West (Ontario), Library and Archives Canada, Robert Dodds household, Item number 1884852, accessed 17 November 2017. 21 Roman Catholic Church, Gündelwangen parish (Gündelwangen, Waldshut, Freiburg, Baden-Württemberg, Germany), Kirchenbuchduplikat, 1810-1869, 1847, baptisms, #4, record for Maria Bertha Rogg, p. 165, with addendum on page 171, Family History Library film #1055226. 22 Passenger and Immigration Lists, 1820-1850, record for Jacob Behringer, Catherine, and Marie Behringer, S.S. Admiral, arrived 4 November 1848 in New York, http://ancestry.com/, subscription database, accessed 17 November 2017. 23 1860 United States Federal Census (population schedule), 7th Ward Buffalo, Erie, New York, p. 77, Jacob Barringer household, http://familysearch.org, accessed 17 November 2017. 24 1860 United States Federal Census (population schedule), 7th Ward Buffalo, Erie, New York, p. 73, Joseph Murri household, http://familysearch.org, accessed 17 November 2017. 25 Passenger Lists, 1820-1957 (image and transcription), record for Joseph, Walburga, Anna, Marie, and Johann Muri, S.S. Hansa, arrived 3 April 1869 in New York, Microfilm Serial: M237, 1820-1897; Microfilm Roll: Roll 308; Line: 38; List Number: 292. http://ancestry.com/, subscription database, accessed 17 November 2017. 26 BZAR, Roman Catholic Church, St. Pancrus parish (Roding, Cham, Oberpfalz, Germany), Marriage record for Johann Maier and Anna M. Urban, 27 October 1857, Vol. 27, page 3 MF 573. 271900 United States Federal Census (population schedule), Buffalo, Erie, New York, E.D. 107, Sheet 16B, Charles Goetz household, https://.ancestry.com, subscription database, accessed 17 November 2017. 28 1900 United States Federal Census (population schedule), Gainesville, Wyoming, New York, E.D. 122, Sheet 9A, John Baumler household, https://.ancestry.com, subscription database, accessed 17 November 2017. For the past two weeks I’ve been on a hiatus from genealogy due to a family health crisis. Today, I’m celebrating both the end of that crisis, and a new DNA match. The DNA match isn’t that new, actually, but I think I’ve figured out just how my new cousins and I are related. The story began last August, when I wrote to some new matches that appeared in my list at Ancestry. The matches were siblings, and Ancestry predicted with high confidence that my match to both of them was in the 4th-6th cousins range, spanning 30 centimorgans (cM) across 2 chromosomes. Both of my matches responded to my messages and suggested that I get in touch with their sister, Carol, who had not yet tested her DNA but who was the more avid family historian in the family. As can happen with all of us, life can get in the way of genealogy research, so I didn’t hear from Carol until a few days ago, when we began comparing notes to see if we could determine how we might be related. Carol told me that her family had roots in Prussian, Russian and Austrian Poland, which suggested a match on my mom’s Polish side. This was supported by the fact that her sibings matched me, but not my Dad’s sister. However, there was also no match between Carol’s siblings and either my mom’s maternal first cousin, or my third cousin on my mom’s maternal side. Although there were no surnames in Carol’s family tree that jumped out at me, I noted with interest that her father’s paternal line was from Zagórów. Unfortunately, this appeared to be a red herring: although I, too, had family from Zagórów, my ancestors were from Zagórów in Słupca County, Wielkpolskie province, while Carol’s tree stated that her ancestors were from Zagórów in Limanowa County, Małopolskie province, nearly 300 miles away. Having cleared up that misconception, the game was now afoot. A common point of geography would be a logical place to begin looking for our connection. I took a closer look at her family tree, paying attention to the surnames that were from Zagórów. It’s been a while since I did any research on my Wielkopolskie lines, and by “a while,” I mean about a decade, so I was a little surprised to find that the answer had been staring me in the face since last August: Celia Przystańska. Katarzyna Tuzik was married to Marcin Przystański in 1862 in the nearby village of Kowalewo-Opactwo. Their marriage record is also found online (gotta love Szukajwarchiwach!) and describes the bride as, “Miss Katarzyna Tuzik, having twenty years of age, daughter of Michał and the late Maryanna; born in Wierzbno and living in that same place with her father….” Although Maryanna’s maiden name is not mentioned here, there is substantial evidence available which indicates that she was Marianna Agata Dąbrowska, daughter of Maciej Dąbrowski and Barbara Słońska. This is where the DNA match comes in — Maciej and Barbara were my own great-great-great-great-grandparents. I’m descended from their daughter, Jadwiga Anna, who married Stanisław Grzesiak. Here’s the relationship chart (Figure 2), which demonstrates that Carol and I are 5th cousins (her maiden surname is used with permission). Figure 2: Relationship chart showing relationship between me and cousin Carol. I’ve discovered that these charts can be a little confusing to the uninitiated. The couple at the top are our common ancestors, Maciej and Barbara Dąbrowski, but after that, the chart shows our lines of descent, not married couples. Thus, Carol descends from Maciej and Barbara’s daughter, Marianna Agata, whereas I descend from their daughter Jadwiga Anna. Marianna Agata married Michał Tuzik (not shown in the chart) and their daughter, Katarzyna Tuzik, carries on the line of descent on Carol’s side. On my side, Jadwiga’s husband Stanisław Grzesiak is not shown, but their son Józef Grzesiak carries on the line of descent. The last generation shown on this chart is my Mom and Carol’s late father — Carol and I would run onto a second page of the chart, but I think the general idea is clear. So, this is a promising lead to the possible connection between Carol and me. A couple things still need to be ironed out, of course. We don’t yet have the marriage record for Cecylia Przystańska and Jan Myśliński, which is necessary to verify Cecylia’s parents’ names. However, the marriage has been indexed at Słupca Genealogy, (Zagórów, 1886, #42), and although records from this year are not available online, they’re on microfilm from the Family History Library. If the marriage record shows that Cecylia’s parents were, in fact, Marcin Przystański and Katarzyna Tuzik, then the documentary evidence would fit nicely with the DNA evidence. None of my new cousins have uploaded their DNA to GEDmatch yet, so it’s unfortunately impossible to get a good sense of which chromosomes and what locations are involved in the match. Moreover, without an upload to GEDmatch, I can’t compare their DNA to that of my late grandmother, whom I tested with FTDNA and not Ancestry. That will be a key comparision to make, because Carol’s siblings, Grandma, and I, will all have to share some overlap in the matching regions. It’s not possible for me to match these cousins according to this pedigree if they do not also match Grandma, because she must be the source of my matching DNA. The amount of shared DNA itself, as reported by Ancestry, is acceptable for this match and would support the predicted relationships. According to this chart by Blaine Bettinger (Figure 3), 5th cousins share on average 17 cM, with a range of 0-42 cM. This relationship — 30 cM across two chromosomes — is at the high end of the range, but still plausible. The fact that it’s perfectly possible for 5th cousins to share NO DNA (0 cM) also explains another facet of this puzzle that I mentioned in the beginning. One of the first steps I take when evaluating a DNA match is to check to see what matches exist in common with the new match. In this case, my Myslinski cousins did NOT match a documented and genetic third cousin to me on our common Grzesiak line, nor did they match my mother’s first cousin on her maternal Zazycki line. How can this be? Let’s examine each of those situations separately. My cousin Valerie descends from my great-grandmother’s sister, Józefa Grzesiak. Józefa would have inherited half of her DNA from her father, Józef Grzesiak, and a quarter of her DNA from her father’s mother, Jadwiga Dąbrowska. Jadwiga inherited all her DNA from her own parents, Maciej Dąbrowski and Barbara Słońska, who are the common ancestors in this puzzle. Remember that these numbers are averages — the amount of DNA that one inherits from such distant relatives can vary a bit, due to the genetic recombination that occurs in each generation. Similarly, my great-grandmother, Weronika Grzesiak, would have inherited a quarter of her DNA from Jadwiga Dąbrowska — but although the proportion of inherited DNA is roughly the same as what her sister Józefa would have inherited, the content can be quite different — there’s no guarantee that the same genes from their great-grandparents Maciej and Barbara were inherited by both Weronika and Józefa. So it’s perfectly possible for the same bit of DNA to have been passed down from common ancestors Maciej and Barbara to me and to cousin Carol, but not to cousin Valerie. (At this point we don’t know which one of my 4x-great-grandparents, Maciej or Barbara, contributed the matching segment that is carried by me and by my Myslinski cousins.) Similarly, it’s possible for me to have inherited this bit through my maternal Grandmother, even though my mother’s maternal cousin did not inherit it. Mom’s cousin, Fred, is 4th cousin once removed to cousin Carol. According to the above chart, fourth cousins once removed share an average of 20 cM, with a range from 0- 57 cM. So it’s possible that Grandma inherited that crucial bit of DNA from Maciej or Barbara that her brother (Fred’s father) did not inherit. Therefore she was able to pass it on to me, resulting in a match between me and Carol, that is not shared by Fred. All of this demonstrates the fact that DNA evidence can support a documented relationship, but when it comes to ancestors as far back as this, a lack of DNA evidence cannot disprove a documented relationship. It’s actually quite remarkable to me to think that the same tiny bit of DNA was passed down from parents Maciej and Barbara to both of their daughters (Jadwiga and Marianna) who in turn managed to pass that bit down through several additional generations, so that cousin Carol and I show up as matches at all. Hopefully this helps to illustrate what a powerful weapon DNA testing can be in your arsenal of genealogy techniques. If you have any recent discoveries that have come about through DNA testing, please let me know about them in the comments — I’d love to read your stories! Happy researching! 1 Akta stanu cywilnego Parafii Rzymskokatolickiej Zagórów (pow. slupecki), Narodowe Archiwum Cyfrowe, Szukajwarchiwach, 1863, births, #278, record for Cecylia Przystanska, accessed on 22 March 2017. 2 SharedcMProject20March2017.png, by Blaine T. Bettinger, is licensed under C.C. BY 4.0. Newcomers to Polish genealogy often start with a few misconceptions. Many Americans have only a dim understanding of the border changes that occurred in Europe over the centuries, and in fairness, keeping up with all of them can be quite a challenge, as evidenced by this timelapse video that illustrates Europe’s geopolitical map changes since 1000 AD. So it’s no wonder that I often hear statements like, “Grandma’s family was Polish, but they lived someplace near the Russian border.” Statements like this presuppose that Grandma’s family lived in “Poland” near the border between “Poland” and Russia. However, what many people don’t realize is that Poland didn’t exist as an independent nation from 1795-1918. The beginning of the end for the Commonwealth came in 1772, with the first of three partitions which carved up Polish lands among the Russian, Prussian, and Austrian Empires. The second partition, in which only the Russian and Prussian Empires participated, occurred in 1793. After the third partition in 1795, among all three empires, Poland vanished from the map (Figure 2). This map gets trotted out a lot in Polish history and genealogy discussions because we often explain to people about those partitions, but I don’t especially like it because it sometimes creates the misconception that this was how things still looked by the late 1800s/early 1900s when most of our Polish immigrant ancestors came over. In reality, time marched on, and the map kept changing. By 1807, just twelve years after that final partition of Poland, the short-lived Duchy of Warsaw (Figure 3) was created by Napoleon as a French client state. At this time, Napoleon also introduced a paragraph-style format of civil vital registration, so civil records from this part of “Poland” are easily distinguishable from church records. During its brief history, the Duchy of Warsaw managed to expand its borders to the south and east a bit thanks to territories taken from the Austrian Empire, as shown in Figure 4. However, by 1815, following the end of the Napoleonic Wars, the Duchy of Warsaw was divided up again at the Congress of Vienna, which created the Grand Duchy of Posen (Wielkie Księstwo Poznańskie), Congress Poland (Królestwo Polskie), and the Free City of Kraków. These changes are summarized in Figure 5. The Grand Duchy of Posen was a Prussian client state whose capital was the city of Poznań (Posen, in German). This Grand Duchy was eventually replaced by the Prussian Province of Posen in 1848. Congress Poland was officially known as the Kingdom of Poland but is often called “Congress Poland” in reference to its creation at the Congress of Vienna, and as a means to distinguish it from other Kingdoms of Poland which existed at various times in history. Although it was a client state of Russia from the start, Congress Poland was granted some limited autonomy (e.g. records were kept in Polish) until the November Uprising of 1831, after which Russia retaliated with curtailment of Polish rights and freedoms. The unsuccessful January Uprising of 1863 resulted in a further tightening of Russia’s grip on Poland, erasing any semblance of autonomy which the Kingdom of Poland had enjoyed. 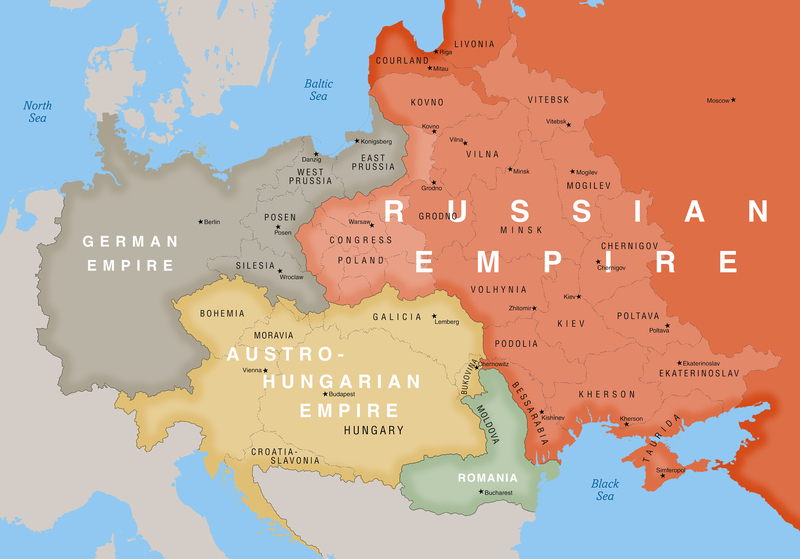 The territory was wholly absorbed into the Russian Empire, and this is why family historians researching their roots in this area will see a change from Polish-language vital records to Russian-language records starting about 1868. The Free, Independent, and Strictly Neutral City of Kraków with its Territory (Wolne, Niepodległe i Ściśle Neutralne Miasto Kraków z Okręgiem), was jointly controlled by all three of its neighbors (Prussia, Russia, and Austria), until it was annexed by the Austrian Empire following the failed Kraków Uprising in 1846. By the second half of the 19th century, things had settled down a bit. The geopolitical map of “Poland” didn’t change during the time from the 1880s through the early 1900s, when most of our ancestors emigrated, until the end of World War I when Poland was reborn as a new, independent Polish state. The featured map at the top (shown again in Figure 6) is one of my favorites, because it clearly defines the borders of Galicia and the various Prussian and Russian provinces commonly mentioned in documents pertaining to our ancestors. Although the individual provinces within the former Congress Poland are not named due to lack of space, a nice map of those is shown in Figure 7. The Republic of Poland that was created at the end of World War I, commonly known as the Second Polish Republic, is shown in Figure 8. The borders are shifted to the east relative to present-day Poland, including parts of what is now Lithuania, Ukraine, and Belarus. This territory that was part of Poland between the World Wars, but is excluded from today’s Poland, is known as the Kresy. 1“Polish-Lithuanian Commonwealth at its maximum extent” by Samotny Wędrowiec, is licensed under CC BY-SA 3.0, accessed 9 January 2017. 2 “Rzeczpospolita Rozbiory 3,” by Halibutt, is licensed under CC BY-SA 3.0, accessed 9 January 2017. 3 “Map of the Duchy of Warsaw, 1807-1809,” by Mathiasrex, based on layers of kgberger, is licensed under CC BY-SA 3.0., accessed 9 January 2017. 4“Map of the Duchy of Warsaw, 1809-1815” by Mathiasrex, based on layers of kgberger, is licensed under CC BY-SA 3.0, accessed 9 January 2017. 5 “Territorial Changes of Poland, 1815,” by Esemono, is in the public domain, accessed 9 January 2017. 6 “Central and Eastern Europe in 1900,” Topgraphic Maps of Eastern Europe: An Atlas of the Shtetl, used with permission, accessed 9 January 2017. 7 “Administrative Map of Kingdom of Poland from 1907,” by Qquerim, is licensed under CC BY-SA 3.0, accessed 9 January 2017. 8 “RzeczpospolitaII,” is licensed under CC BY-SA 3.0, accessed 9 January 2017. 9 “Occupation of Poland (1939-1945),” Wikipedia, accessed 9 Janary 2017. 10 “Potsdam Conference,” Wikipedia, accessed 9 January 2017. 11 “Territorial changes of Poland immediately after World War II,” Wikipedia, accessed 9 January 2017. 12 “Western betrayal,” Wikipedia, accessed 9 January 2017. In my previous two posts, I gave some historical background about the evolution of vital records keeping in Poland, and about the implications of those practices for researchers today, seeking records of their ancestors. Today, I’d like to provide some examples of the kinds of records you might expect to see from the various partitions and from different time periods, to give you an idea of what you might expect to encounter in your own research. I’ll start off with a couple of examples from the Prussian partition, and a little confession: Although my husband has ancestors from Prussian Poland, and although I have every intention of researching those ancestors at some point, I haven’t done much research in this area yet. Therefore, I don’t have a huge wealth of examples to offer, but here are a couple. Figure 1 shows a Catholic baptismal record from 1858 for Stanislaus (Stanisław in Polish) Lewandoski,1 also known as Edward Levanduski, my husband’s great-great-grandfather, about whom I wrote previously. The record is in columnar form, and column headings, from left to right, tell us the number of the birth record, the year, day and month of the birth, the place of birth, date of baptism and child’s name, the name of the priest who baptized the child, the parents’ names, father’s occupation, and then additional information on godparents’ names (cut off in this image). The record is written in Latin. Unfortunately, no information is given on the parents’ ages. 2. the unmarried maiden Agnes Jamrozik, personally known, Catholic, born on 9 January 1865 in Kucharki, county Kleschen, living in Kucharki, daughter of the innkeeper Johann Jamrozik and his wife Rosalie, nee Juszczak, living in Kucharki. Notice that the record was created on a fill-in-the-blank form, with all the standard boilerplate text preprinted, so translating these civil records becomes a matter of learning to read a relatively small amount of German script. In contrast to the brief church book entry, this record contains a lot of wonderful genealogical details, including the precise birthdate and birth place of the bride and groom, occupations and ages of the witnesses, and more. For those of you who might be panicking and thinking, “But I can’t read German!” help is on the way. The very best translation guides that I have found for genealogy are written by Jonathan D. Shea and William F. Hoffman. Their “In Their Words” series of genealogical translation guides encompasses 3 volumes to date, Volume I: Polish, Volume II: Russian, and Volume III: Latin. Volume IV: German is currently in the works and will hopefully be out very soon. I cannot praise these books highly enough. These are the books that are constantly lying around the house, never making it back to the bookshelf, because I’m always referring to one or another of them for something. I can’t wait for their German book to be published so I can learn to read these records for myself. In the meantime, there’s always the Genealogy Translations group on Facebook, if you (or I) need assistance. In Russian Poland, the standard Napoleonic format existed from 1808-1825, followed by a modified format that was used from 1826 through the 20th century. So a civil death record from 1936 (Figure 3) looks much the same as a civil death record from 1838 (Figure 4). The style of this record is very much the same as in the previous examples. This is good news for those who are interested in learning to translate vital records, and it suggests a potential research strategy: If the prospect of translating Russian records is intimidating, try to trace back before 1868, and work on the records written in Polish first. This worked really well for me. My first foray into vital records from Poland occurred when I began researching the family of my great-grandmother Weronika Grzesiak. She was born in 1876 in a village within Russian Poland, so her birth record was written in Russian, along with the birth records for most of her siblings. I took one look at the page and thought it was hopeless. However, I knew her parents were married about 1865, back when the records were still written in Polish. I decided to look for their marriage record first, and then research earlier generations of the family tree. Starting out with those Polish records gave me a chance to familiarize myself with the grammatical structure of Slavic languages and the format of the vital records, and eventually I gained enough confidence to tackle that Russian cursive. There are some good translations aids out there, some of which I shared previously. However, if you’re going to get serious about learning to translate Polish and Russian vital records comfortably, then you really need to get copies of Shea and Hoffman’s translation guides that I mentioned at the beginning of this post. I know quite a few people — native English speakers — who never studied Polish or Russian formally, but have nonetheless taught themselves to read vital records in those languages, and it’s thanks to Shea and Hoffman. Column headings, from left to right, tell us the month and date of the wedding, the house numbers of the bride and groom and who is moving in with whom. In this case, “de 33 ad 84” suggests that after the marriage, the groom will be moving from his house, number 33, to the bride’s house, number 84. The groom’s name and occupation (“figulus,” i.e. potter) is given, and check marks in the appropriate columns tell us that he was Catholic and a widower. The “Aetas” column tells us that he was 46 years old. Similarly, the bride was a 35-year-old Catholic widow named Magdalena Bulgewicz, widow of the late Dominik. Although the standard nominative form of Magdalena’s married name was Bulgewicz, the form used here, “Bulgewiczowa,” describes a married woman of the Bulgewicz family. Her maiden name is not provided. Additional information includes the names and social position of the witnesses, and the name of the priest who performed the marriage. In contrast, this slightly later record from 18617 in the same parish (Figure 7) includes all the same information as the earlier record, but also includes the names of the parents of the bride and groom (boxed in red) and provides a bit of a description about them (“oppidario,” meaning “townsperson”). Disappointingly, this early marriage record from Kołaczyce from 17507 (Figure 8) shows relatively little information. In translation, this reads, “On this same day, I who am named above, blessed and confirmed a marriage contract between Stanislaus Niegos and Teresa Szaynowszczonka, having been preceded by three banns and with no canonical impediments standing in the way, in the presence of witnesses Casimir Rączka and Joannes Dystanowicz, all of Kołaczyce.” The form of the bride’s name used here, “Szaynowszczonka,” indicates an unmarried woman of the Szaynowski family, which would be rendered “Szajnowska” in modern Polish. It helps to remember that this record predates the requirement for church records to perform double-duty as civil records for the Austrian authorities. Therefore, the priest’s only purpose in keeping it was to fulfill the obligations imposed upon him by the Roman Ritual. Since the Church had no interest in the addresses, ages, or occupations of the individuals mentioned in the record, that kind of information does not appear. In any case, finding a marriage record from 1750 for one’s Polish ancestors is actually pretty respectable, which brings us to my next point. A Word About Early Records…..
Don’t expect too much from early records, and by “early,” I’m referring to Polish vital records for peasants, late-1600s to about 1750 records. As is evident from the history, recognition of the importance of vital records developed gradually. Perhaps this is why I have frequently found church records to be somewhat “spotty” in the late 1600s and early-to-mid 1700s. By “spotty,” I mean that records that “ought” to be found in a particular parish in a given year just aren’t there. It’s impossible to say for certain why this is, and in some of these cases, the event may have occurred in Parish B, despite evidence from other documents stating that it occured in Parish A. But for whatever reason, it seems that priests became more conscientious about over time, as their responsibilities as record-keepers for the civilian authorities increased. If you’re able to locate those early vital records, that’s a victory, but understand that there’s a chance the record will just not be there. Poland’s complicated geopolitical history is reflected in her record-keeping practices, which can be confusing to the uninitiated. The different languages in which the records are kept might be challenging, too. However, the payoff comes in the satisfaction of being able to locate and read your ancestors’ story for yourself, as preserved by their paper trail. I hope you’ve enjoyed this look at the history of Polish vital records, with some examples from each partition. As always, I welcome feedback, including observations and insights based on your own research, so feel free to leave a note in the comments. Happy researching! 1 Roman Catholic Church, Gąsawa parish (Gąsawa, Żnin, Poland), Księgi metrykalne, 1782-1960, Akta urodzeń 1847-1860, 1859, births, #73, record for Stanislaus Lewandoski. ; 1191249 Items 1-3. 2 “Urzad Stanu Cywilnego Kucharki,” Narodowe Archiwum Cyfrowe, Szukajwarchiwach (http://www.szukajwarchiwach.pl/), Akta malzenstw 1874-1909, 1890, #13, marriage record for August Draheim and Agnes Jamrozik, accessed on 1 October 2016. 3 Urząd stanu cywilnego gminy Młodzieszyn, Sochaczewski, Mazowieckie, Poland, 1936, #16, death certificate for Marianna Zielińska. 4 “Akta stanu cywilnego Parafii Rzymskokatolickiej Kowalewo-Opactwo (pow. slupecki),” Narodowego Archiwum Cyfrowego, Naczelnej Dyrekcji Archiwów Panstwowych, Szukajwarchiwach (Szukajwarchiwach.pl), 1838, Zgony, #5, record for Wojciech Grzeszkiewicz, accessed on 1 October 2016. 5 “Akta stanu cywilnego parafii rzymskokatolickiej w Mlodzieszynie, ” Polskie Towarzystwo Genealogiczne, Metryki.genealodzy.pl: Projekt Indeksacji Metryk Parafialnych (http://metryki.genealodzy.pl/), 1897, Zgony, #3, record for Antonina Grzegorek. Accessed on 1 October 2016. 6 Roman Catholic Church, St. Anna’s Parish (Kołaczyce, Jasło, Podkarpackie, Poland), “Śluby, 1826-1889,” Stare Kopie, 1834, record for Franciscus Łącki and Magdalena Bulgewiczowa, Archiwum Archidecezjalne w Przemyślu, Przemyśl, Poland. 7 Roman Catholic Church, St. Anna’s Parish (Kołaczyce, Jasło, Podkarpackie, Poland), “Śluby, 1826-1889,” Stare Kopie, 1861, #11, marriage record for Jacobus Łącki and Anna Ptaszkiewicz, Archiwum Archidecezjalne w Przemyślu, Przemyśl, Poland. 8 Roman Catholic Church, St. Anne’s parish (Kołaczyce, Jasło, Podkarpackie, Poland), “Księga małżeństw parafii Kołaczyce 1748 – 1779,” 1750, marriage record for Stanislaus Niegos and Teresia Szaynoszczonka, Archiwum Archidecezjalne w Przemyślu, Przemyśl, Poland. The sweetest victories are the ones that took the longest time in coming. A couple days ago, I happened upon some documents that fundamentally changed my understanding of my Grzesiak family history, documents I’ve been seeking for many years. So there is some major happy dancing going on in the Szczepankiewicz house today, albeit limited to just one of its residents. In a previous post, I wrote a little about the family of my great-grandmother, Veronica (née Grzesiak) Zazycki. Veronica immigrated from the little village of Kowalewo-Opactwo in Słupca County to Buffalo, New York, where she was eventually joined by three of her siblings: Władysław (“Walter”), Tadeusz/Thaddeus, and Józefa/Josephine. Regarding Veronica’s oldest brother, Grandma told me that Walter had married an actress in Poland, whose name Grandma remembered as “Wanda,” but she didn’t want to leave her career, so he left her and came to the U.S. without her. There were no children from this marriage. When I began to look for documentation for these family stories, I realized the situation wasn’t exactly as Grandma had portrayed it. The 1900 census (Figure 1) shows the Grzesiak family all living on Mills Street in Buffalo, consisting of patriarch Joseph, sons Władysław and Thaddeus, daughter Jozefa, and daughter-in-law Casimira — Walter’s wife of two years. Clearly, Walter’s wife DID come to Buffalo, rather than staying in Poland while he left without her – but her name was Casimira, not Wanda. The census goes on to state that at that time, she was the mother of 0 children, 0 now living, consistent with family reports. Figure 1: Extract from the 1900 U.S. Federal Census, showing the Grzesiak family. In the 1905 New York State Census (Figure 2), Walter and Casimira were still living in Buffalo, so the marriage lasted at least 7 years. Subsequent records (e.g. the 1940 Census) do indeed show Walter as divorced or a widower. Figure 2: Extract from 1905 New York State Census showing Walter and Casimira Grzesiak. Walter’s death certificate1 reports his ex-wife’s name as “Katarzyna Dutkiewicz (Figure 3), and the informant was his brother, Thaddeus. Figure 3: Extract from Walter Grzesiak’s death certifcate. Clearly, Thaddeus made a mistake with the first name, reporting it as Katarzyna (Katherine) instead of Kazimiera/Casimira. So how much faith should we put in his version of her maiden name, Dutkiewicz? Death records are often viewed with some circumspection, since someone other than the deceased is providing the information, and that person might be grieving or in shock. However, it was all there was to go on, and it seemed like it should have been a good start: Name, Kazimiera Dutkiewicz (or similar), born about 1880 (based on those census records), married to Władysław Grzesiak in Poland circa 1898. Since Walter Grzesiak was born in Kowalewo-Opactwo, it seemed logical that he would have married somewhere in that vicinity, although not necessarily in that parish. Things get a little tricky with the records for Kowalewo-Opactwo in that time period. Records are not online, or on microfilm from the LDS, so one must write to the Konin Branch of the State Archive in Poznań to request a search. Moreover, although Walter was baptized in Kowalewo, that parish was temporarily closed from 1891-1910. Parish operations were transferred to the church in nearby Ląd, but after 1911, the parishes and their records were separated again. Unfortunately, the archive reported that there was no marriage record in Ląd for Władysław Grzesiak, or for any of his siblings, during this period. Initially, this finding didn’t concern me too much. It’s traditional for a couple to marry in the bride’s parish, so this suggested merely that Kazimiera was from some other parish in the area. So how does one find a marriage in the Poznań region, when one has no idea what parish the couple married in? The Poznań Marriage Project, of course. For those who might be unfamiliar with this resource, the Poznań Project is an indexing effort conceived by Łukasz Bielecki, which is intended to include all existing marriage records for the historic Poznań region from 1800-1899. Currently, the project is estimated to be at least 75% complete, so there was a good chance I’d be able to find Walter and Casimira’s marriage in there. Frustratingly, there were no good matches, so I assumed that their marriage record must be among the 25% of existing records that remain unindexed. At this point, finding it would be like searching for the proverbial needle in a haystack. I put this on the back burner and went back to more productive research on other family lines. It seemed like a perfectly ordinary Wednesday afternoon. I paid bills, ran some errands, took the cat to the vet, and sat down to check e-mail. But if you’re like me, some small part of your brain is always thinking about genealogy, and suddenly it dawned on me: the family story was that Casimira was an actress. How could she have been an actress in a small village with a couple dozen farms? She must have been from a big city — Warsaw! Figure 4: Geneteka search results for Grzesiak marriages in Warszawa between 1897 and 1899. Let’s break this down a bit. First, the double dates are often confusing to those who aren’t familiar with the format of Polish civil records, but they’re a result of the fact that Poland and Western Europe adopted the Gregorian calendar while Russia and the Eastern Europe continued to use the old Julian calendar. In order to have these records be clear to everyone, both dates were included on legal documents like this. The second, later date is the date according to the Gregorian calendar, which we would go by. Second, Kazimiera’s name isn’t Dutkiewicz, as expected — but we’ll worry about that in a minute. The date of the marriage (1898) is correct, as is the groom’s name, and parents’ names. His age is a bit off (he should only be 30, not 37), but it’s not unusual for ages reported in these records to be very much “ballpark estimates.” Walter was actually born in Kowalewo, not Ląd, but if you recall, the parish functions had been transferred from Kowalewo to Ląd at this time, so perhaps this can be interpretted as a reference to that. Getting back to Kazimiera, her age (18) matches with what we expected based on U.S. records. The priest doesn’t mention her budding theatrical career, but perhaps her star had not yet risen very far (if it ever really rose at all). So this is clearly the right marriage record. But how did we get from Olczak to Dutkiewicz? It appears that shortly after Kazimiera’s birth in 1880, her mother Paulina married Tomasz Dutkiewicz. Whether Tomasz Dutkiewicz ever legally adopted Kazimiera is doubtful, but this certainly explains why she might have at least informally used the name of her step-father as her own. So all this is nice, right? But why is a marriage record for a great-granduncle really THAT exciting? As I mentioned, my great-grandmother Veronica emigrated along with three siblings, Walter, Thaddeus and Josephine. What we didn’t know until I began researching records from Poland, was that there were two additional siblings — Konstancja3 and Pelagia4 — who did not emigrate. No descendant of the Grzesiak family in the U.S. that I interviewed was aware that these sisters existed. The Konin Branch of the State Archive in Poznań had no record of marriage for either of them, and I was planning to write again to request a search for their death records, assuming they might have died before reaching a marriageable age. However, I noticed that there was a marriage record for a Konstancja Grzesiak on the same page of Geneteka search results (Figure 4, result 2) that gave me Walter’s marriage record! Sure enough, the marriage record5 reveals that Konstancja is the daughter of Józef Grzesiak and his wife, Marianna née Krawczyńska, residing in the village of Ląd. So I might have cousins in Poland from this Cieniewski line! However, it’s interesting that there are only two births. Birth records for this parish, St. Stanislaus, Bishop and Martyr, and St. Adalbert, in the Wola district of Warsaw, are indexed from 1886 to 1908 without any gaps. Therefore one might expect to see more than two children born between their marriage in 1898 and 1908 when the records end. There is no evidence that they immigrated to Buffalo, no good matches in U.S. census records for this family in Buffalo or anywhere else. So where did they go? One clue, in Walter’s marriage record, might point the way. It stated that he was the son of “Józef Grzesiak, farmer, and his wife Maryanna née Krawczyńska, in the village of Borowo residing” Borowo is new to me. This is the first time this place has been mentioned in connection with my family. And unfortunately, there are at least 20 places in Poland today by that name. But if Borowo was where her parents were living at the time of Konstancja’s marriage, maybe that’s where she and her young family eventually went to live. So which Borowo is correct? According to the Skorowidz Królestwa Polskiego, a nice period gazetteer of Russian Poland published in 1877, the village of Borowo belongs to the Roman Catholic parish in Krzymów, so that’s where we can look for records. Records are online and on microfilm, but only from 1808-1884, which doesn’t help us any with finding additional births to Konstancja and Julian Cieniewski after 1900. However, the Branch Archive in Konin has birth records up to 1911, so this is an obvious next step to take. There’s one other really cool connection I’d like to make before I sum things up. In my previous post about my Grzesiak family, I mentioned my grandmother’s recollection that her mother Veronica’s family owned a grain mill near the parish church. Try as I might, I couldn’t find any reference to Veronica’s father being a miller. However, when I visited Veronica’s birthplace of Kowalewo-Opactwo on a trip to Poland last year, I was amazed to see this old windmill, missing its vanes, in close proximity to the church, exactly as Grandma described. So I found it fascinating that Walter’s marriage record described him clearly as a miller, even though a more general term (“хозяин,” meaning “owner,” but seemingly used as a non-specific synonym for “farmer” or “peasant”) was again used to describe his father, Józef. This makes me more convinced that the mill in the photo actually was a place associated with Veronica’s family. Maybe her father didn’t own the mill, maybe he just worked for the miller — but between the existence of this mill where it should be, based on Grandma’s story, and the fact that her uncle Walter was described as a miller, I think there’s good reason to believe that this was the mill that Grandma’s story referred to. So what general research insights can be gained from this? Once again, my ancestors were more mobile than I expected them to be — and yours might be, too. When I began my research, I really thought I’d find “the” ancestral village for each surname line and be able to go back for many generations in that same village. Time and time again, that seems to be the exception, rather than the rule. I was so blinded by my expectation that Walter would have met his bride some place near to where he was born, that I overlooked obvious resources, like indexed records for Warsaw on Geneteka, because it seemed too improbable. Logic requires us to search in the obvious places first — those associated with the family. But when searching in the obvious places doesn’t pan out, it’s time to think outside the box. 2. Family stories can sometimes hold the key. If you are among the oldest generation in your family, it’s not too late to write down everything you remember from older relatives, for the next generation. But if you still have any older relatives remaining, talk to them! My third cousin and research collaborator, Valerie Baginski, told me that her grandmother always said that the family came from Warsaw, rather than Poznań, which was my family’s version of the story. Once we figured out that our Grzesiaks’ ancestral village was Kowalewo-Opactwo, closer to Poznań than Warsaw, we dismissed that mention of Warsaw. Since Warsaw was a bigger city than Poznań, we chalked up this discrepancy to our ancestors’ tendency to paint their place of origin with a broad brush, referencing the closest big city. Now we realize that it’s quite possible her great-grandmother mentioned Warsaw because she was one of the younger siblings who may have lived there for a time, while my great-grandmother mentioned Poznań because she was the first one to leave Poland, and may never have gone to Warsaw with the others. This last “insight” is a shameless plug for Geneteka, the database for indexed Polish vital records that enabled me to find my Grzesiaks in Warsaw. For those of you who might be unfamiliar with it, Geneteka is a project sponsored entirely by volunteers from the Polskie Towarzystwo Genealogiczne (PTG, or Polish Genealogical Society), in Poland. Although all the indexing and photographing of vital records (for Geneteka’s sister site, Metryki, which I wrote about previously) is done by volunteers, funds are still required to pay for servers to host the websites. If you’ve used Geneteka and found it helpful to you, please consider making a donation to the PTG. Let’s help them to help us find our ancestors! Walter’s marriage record was a puzzle piece that’s been missing for a long, long time. It just goes to show you that you never know when that great idea will hit, or when serendipity will strike, so keep chipping away at those brick walls. Stay thirsty, my friends. 1New York, Department of Health, Division of Vital Statistics, County of Erie, City of Buffalo, Death Certificates, #2600, Death certificate for Walter Grzesiak, 25 April 1946. 2“Akta stanu cywilnego parafii rzymskokatolickiej sw. Stanislawa i Wawrzynca w Warszawie,” Polskie Towarzystwo Genealogiczne, Metryki.genealodzy.pl: Projekt indeksacji metryk parafialnych (http://metryki.genealodzy.pl/), 1898, Malzenstwa, #223, record for Wladyslaw Grzesiak and Kazimiera Marianna Olczak, accessed on 17 August 2016. 3Roman Catholic Church, Sts. Peter and Paul the Apostles Parish (Kowalewo, Słupca, Wielkopolskie, Poland), Kopie księg metrykalnych, 1808-1879, 1872, births, #5, record for Konstancja Grzesiak. ; FHL #1191028 Items 1-4. 4“Akta stanu cywilnego Parafii Rzymskokatolickiej Kowalewo-Opactwo (pow. slupecki)”, Narodowego Archiwum Cyfrowego, Naczelnej Dyrekcji Archiwów Panstwowych, Szukajwarchiwach (Szukajwarchiwach.pl), Ksiega urodzen, malzenstw i zgonów, 1869, births, #48, record for Pelagia Grzesiak, accessed on 21 June 2016. 5“Akta stanu cywilnego parafii rzymskokatolickiej sw. Stanislawa i Wawrzynca w Warszawie “, Polskie Towarzystwo Genealogiczne, Metryki.genealodzy.pl: Projekt indeksacji metryk parafialnych (http://metryki.genealodzy.pl/), 1898, Malzenstwa, #142, record for Julian Aleksander Cieniewski and Konstancja Grzesiak, accessed on 18 August 2016. 6Ancestry.com, Baltimore, Passenger Lists, 1820-1948 and 1954-1957 (Provo, UT, USA, Ancestry.com Operations Inc, 2006), http://www.ancestry.com, The National Archives at Washington, D.C.; Washington, D.C.; Records of the US Customs Service, RG36; NAI Number: 2655153; Record Group Title: Records of the Immigration and Naturalization Service, 1787-2004; Record Group Number: 85, record for Veronika Gresiak, accessed on 21 July 2016. Wodzinowski, Wincenty. Wesele. Digital image.Http://muzeuminstrumentow.pl/. Muzeum Ludowych Instrumentów Muzycznych W Szydłowcu, 18 Sept. 2015. Web. 18 Aug. 2016. This painting from 1896 seemed very fitting for my cover photo, since it depicts a wedding celebration very close to the time when Walter and Casimira married. A few days ago, I wrote to the Konin branch of the Polish State Archive of Poznań to request a search for death records for Pelagia and Konstancja Grzesiak, who were two sisters of my great-grandmother. This is pretty routine for me now, but when I first began researching Polish vital records, I was intimidated by the thought of writing to an archive in Poland. I worried that it would be prohibitively expensive, and I worried about translating their correspondence in an era before Facebook groups and Google Translate. However, writing to the archives is pretty straightforward, and should be a standard research strategy for anyone researching Polish ancestors. In this post, I’ll walk you through the process of writing to an archive to request records for your family in Poland. Why Write to an Archive? Although it’s true that more and more vital records from Poland are coming online every day, thanks to the efforts of both the state archives and the various Polish genealogical societies, there are still plenty of records that are not available online or on microfilm from the LDS. Some of these records can be found in the diocesan archives, some are in the state archives, and some may still be at the parishes themselves. You might need to rely on multiple sources to find records in the range of years you need to thoroughly document your family history. As an example, for my Grzesiak’s ancestral parish in Kowalewo-Opactwo, the LDS has both church and civil records available on microfilm. However, upon closer examination, we see that the civil records only go from 1808-1865, then there’s a two-year gap, after which coverage extends from 1868-1879. The church records might be helpful in tracing some of my collateral lines forward in time, since they begin in 1916, but they aren’t useful for finding ancestors. Those records go all the way up to 1979 (with gaps), which is interesting, given that Polish privacy laws typically restrict access to such recent records. 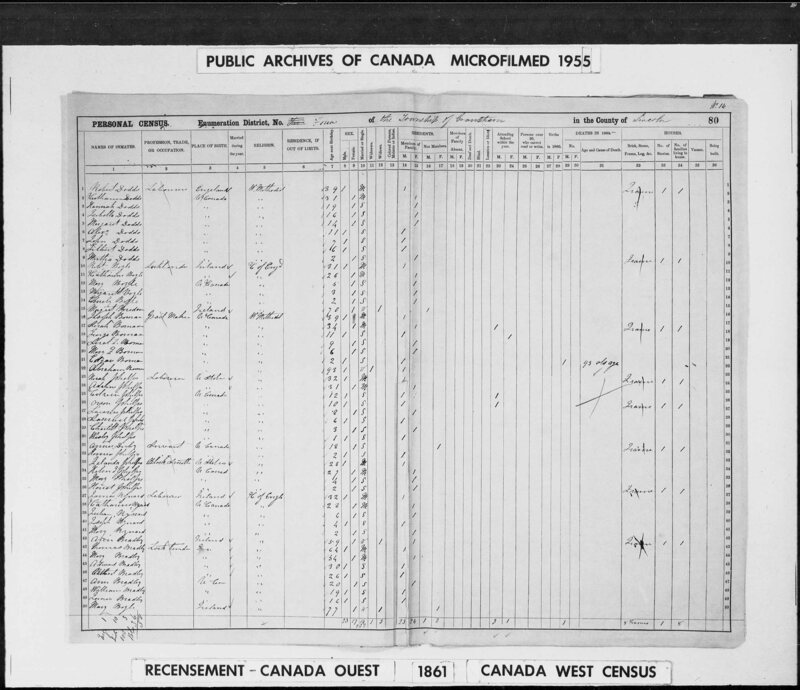 Microfilm is great, but online access is even better, and in the years since I began researching this family, records for Kowalewo have come online for those same years from 1808-1879, including that same gap from 1866-1867. One might conclude that the records from 1866-1867 were destroyed, since they don’t appear in either the online collection from the Archiwum Państwowe w Poznaniu Oddział w Koninie (State Archive of Poznań Branch in Konin) or on the LDS microfilm. However, that’s not the case, those records DO exist. How do we know this? Baza PRADZIAD can be searched quickly, easily, and in English to see what vital records are held by the various state archives for any given parish or civil registry office. Note that you must know the parish or civil registry office for your village of interest. If I search for records for Wola Koszutska, which is a village belonging to the parish in Kowalewo, I won’t get any hits. But I can find records for ancestors born in Wola Koszutska by knowing that their vital events would have been recorded at the parish in Kowalewo. Although Polish diacritics aren’t supposed to be important when searching this site, I’ve had it happen on occasion that a search without diacritics comes up empty, but redoing the search with diacritics gives good results. Maybe that was due to cybergremlins, or maybe there are bugs that only affect certain parishes, but it’s something to consider if nothing turns up the first time you search. There are ways to set up your keyboard to allow for Polish diacritics, but if you haven’t done that or don’t know how, there’s always this site which works in a pinch so you can copy and paste your proper Polish text into the search box. Figure 1 shows the search screen, and as you’ll see, I got results only by entering the town name. There are options for restricting the search by entering the “commune” (i.e. gmina), province, religion, or type of event you’re looking for, but you really don’t need all that, and sometimes simple is best. Let’s consider these search results a bit more carefully. In Figure 2, we see that there are two collections of marriage records (małżeństwa) for Kowalewo. The first collection, boxed in red, covers marriages from 1808-1819, 1821-1890, and 1911. This collection belongs to the Archiwum Państwowe w Poznaniu Oddział w Koninie, as we can see from Figure 3 which comes up when we click, “more.” The second collection, boxed in green (Figure 2), covers marriages from 1828-1866. If we obtain more information about that collection (Figure 4), we realize that both collections are for the same Kowalewo, and they’re stored in different archives! Welcome to the murky world of archival holdings in Poland. It would be great if there were one, central repository for all vital records in Poland, and if those holdings were completely catalogued, and if that catalogue were searchable online at only one website. But as my mother always says, “If wishes were horses, beggars would ride.” Although you may find that some diocesan archives have their holdings catalogued in Baza PRADZIAD, not all do. So I generally think of this as a catalogue for the holdings of State Archives, and if any diocesan results come up as well, that’s icing on the cake. Now let’s go back to Figure 2. If you compare the boxes in red, blue and yellow, you see that these represent marriages, births (urodzenia) and deaths (zgony) for the same range of years. This makes sense, because frequently parishes would keep one parish register for each year, divided into three sections. Looking further at Figure 3, we notice the “dates” and “microfilms” underlined in purple and yellow, respectively, and herein lies the answer to the problem of our two-year gap in microfilmed and online records that exists from 1866-1867. As you can see from the text underlined in yellow, the archive also has those same microfilms, with the same gap. But their total collection, underlined in purple, includes years which are not available on microfilm. Whereas online and microfilmed records end in 1879, the archive also has births, marriages and deaths from 1880-1890, in addition to having births, marriages and deaths to fill that gap from 1866-1867. How Do I Write to the Archives? First, you want to make sure that the records aren’t available any other way (e.g microfilm or online), before you write, as archival research is generally slower and more expensive than obtaining records by these other methods. Popular websites for Polish vital records include Szukajwarchiwach (“Search in the Archives” or SwA), Metryki.GenBaza (or just, “GenBaza”), Metryki.Genealodzy.pl (or just “Metryki”), Poczekalnia (“Waiting Room,”), Genealogiawarchiwach (“Genealogy in the Archives”, or GwA), the digital collections for Poland available from the LDS, and others (mentioned on this list, starting at the bottom of page 3). If you’re not familiar with these sites and don’t know how to use them, visit us in Polish Genealogy and we’ll help you out. To determine whether your parish of interest has been microfilmed by the LDS, check the Family History Library catalog. If it looks like your records of interest can only be found at one of the archives, you can send an e-mail to the address found in your Baza PRADZIAD search results (see above). You should write in Polish. Since this is professional correspondence, this is not a good time to break out Google Translate. Instead, use one of the letter-writing templates that are available online, either from the LDS or the PGSA. Alternatively, you can post a translation request in one of the Facebook groups (Polish Genealogy or Genealogy Translations) and a volunteer will probably assist you with a short translation, if you ask nicely. The cost of archival research depends on how many years they have to search, whether or not they find anything, and which archive you’re writing to. You might think it would be standardized across the country, but that hasn’t been my experience. I have paid as little as 4 zlotys ($1) to the Archive in Grodzisk for two records found after a search of marriages over a 12-year period, and as much as $30 to the Archive in Konin after a search of marriages over a 9-year period that turned up empty. (In that case, it’s possible that the girls died before reaching a marriageable age.) It’s important to have very clear, specific research goals in mind, however. Sending the archive a request that’s too vague, such as, “please search all your records for Kołaczyce for the surname Kowalski” or too broad, such as, “please search all your death records for Kołaczyce from 1863-1906 for Łącki deaths” is probably not advisable. For that kind of research, it would be better to hire a professional in Poland who can visit the archive for you in person. What Happens When They Find My Records? When the archive has completed their research, they will reply to notify you of the results. The letter or e-mail will be in Polish; if you need assistance with translating it, I would again recommend those Facebook groups (Polish Genealogy or Genealogy Translations). If they found records, they will summarize their findings, but you will not receive copies until you make payment. If they didn’t find anything, they will still charge you a search fee for the time they had to spend looking. How Do I Make Payment? The archives will only accept payment by direct wire transfer to bank account number specified in their correspondence. They do not accept personal checks, credit cards, cash, or PayPal. Here’s where it gets tricky: most U.S. banks charge high fees for international wire transfers. However, there are alternatives to paying your bank. You can set up a wire transfer with a company like Western Union or Xoom, where the fees are typically much lower. If you live in a community with a Polish travel agency, you can often ask them to wire money for you for a small fee. Or, you can ask a professional researcher in Poland to handle the transaction for you, and you can reimburse him or her via PayPal. (Be sure to add in a tip if the researcher does not specify a charge for his or her time). When Will I Get My Records? Again, your mileage may vary, based on the archive in question, but in general, I’ve gotten results within a week or two after payment has been made. Be sure to attach your payment receipt to your return e-mail to the archive. I’ve always received my records in the form of digital images sent via e-mail, but I’ve heard from others who say they’ve always received hard copies. That’s pretty much all there is to it! Writing to archives in Poland doesn’t have to be an intimidating process, nor will it necessarily break the bank. As long as you have clearly defined research goals and a relatively small range of years for them to check, archival research can be quite affordable. If you’ve been on the fence about writing to an archive, I hope this encourages you to go ahead and give it a try. And if you do, please let me know how it turns out. Happy researching! My son Daniel left for Poland yesterday. I’ve been helping him prepare for his trip, and thinking a lot about my own amazing journey through Poland last summer, which included visits to all my ancestral villages that were known at that time. And after my recent post about the 1791 purchase of a home in Zagórów by my ancestors, Andrzej and Marianna Krawczyński, I’ve been thinking more about that line in particular. My most recent ancestor with the Krawczyński surname is my great-great-grandmother, Marianna (née Krawczyńska) Grzesiak. It was Marianna’s daughter, Veronica, who immigrated to the U.S. as a young girl, married John Zazycki, and eventually gave birth to my grandmother, Helen (née Zazycki) Zielinski. My grandmother died a year ago, but I vividly remember sitting in Grandma’s immaculate kitchen as a young teenager, asking her about her mother’s life in Poland before she came to this country. I wrote down Grandma’s comments and kept them in mind as I began to document my family’s history. Baptismal records for Veronica’s siblings describe Józef Grzesiak as a “parobek,”3 (farmhand), again with the Russian word “хозяин,”4,7,8 and with the Russian word, “наёмщик,”5 which Shea and Hoffman define as,”hirer, lessee, tenant, lodger.”6 But nowhere do we see the word for “miller,” in Polish or in Russian. I had pretty much decided that this was one of those inaccuracies in family stories, something that had gotten slightly distorted in the oral history as it was handed down over four generations. Until I got to Poland. So how do we reconcile this? Perhaps Veronica’s family didn’t own the mill — perhaps she only mentioned that they lived near the mill, and my grandmother misremembered the story? Or perhaps the records which describe Veronica’s father as a “tenant” or “farmhand” could be construed to mean that he was a hired hand, working for the miller? The village miller held a position of some stature , so perhaps the priest recording the baptismal records would have been reluctant to describe Józef Grzesiak that way if he was only employed by the miller but did not own the mill. I have no doubt about the truth of the story that Veronica’s mother, Marianna, sewed vestments for the parish priest. Veronica supported her family as a seamstress after her husband died, and was known for her strong Catholic faith. So it’s tempting to believe that somehow, that old mill near the church in Kowalewo might really be the one from Grandma’s stories, and might be connected with my family in some way. What do you think? 1“Akta stanu cywilnego Parafii Rzymskokatolickiej Kowalewo-Opactwo (pow. slupecki)”, Narodowego Archiwum Cyfrowego, Naczelnej Dyrekcji Archiwów Panstwowych, Szukajwarchiwach (Szukajwarchiwach.pl), Ksiega urodzen, malzenstw, zgonów, 1876, # 72, birth record for Weronika Grzesiak, accessed on 21 June 2016. http://www.szukajwarchiwach.pl/54/771/0/6.1/65/skan/full/9J-ASKf3S2mu9O7J_5zYew. 2Shea, Jonathan D., and William F. Hoffman. In Their Words: A Genealogist’s Translation Guide to Polish, German, Latin, and Russian Documents: Volume II: Russian. New Britain, CT: Language & Lineage Press, 2002, p. 430. 3″Akta stanu cywilnego Parafii Rzymskokatolickiej Kowalewo-Opactwo (pow. slupecki),” Ksiega urodzen, malzenstw, zgonów, 1867, births, #39, record for Władysław Grzesiak, accessed in person at the archive by Zbigniew Krawczynski. ; Archiwum Państwowe w Poznaniu. Oddział w Koninie, 3 Maja 78, Konin, Poland. 5Roman Catholic Church, Sts. Peter and Paul the Apostles Parish (Kowalewo, Słupca, Wielkopolskie, Poland), Kopie księg metrykalnych, 1808-1879, 1872, births, #5, record for Konstancja Grzesiak. ; FHL #1191028 Items 1-4. 6Shea, Jonathan D., and William F. Hoffman. In Their Words: A Genealogist’s Translation Guide to Polish, German, Latin, and Russian Documents: Volume II: Russian. New Britain, CT: Language & Lineage Press, 2002, p. 392. 7“Akta stanu cywilnego Parafii Rzymskokatolickiej Kowalewo-Opactwo (pow. slupecki)”, Narodowego Archiwum Cyfrowego, Naczelnej Dyrekcji Archiwów Panstwowych, Szukajwarchiwach (Szukajwarchiwach.pl), Ksiega urodzen, malzenstw, zgonów, 1874, births, #17, record for Tadeusz Grzesiak, accessed on 21 June 2016. http://www.szukajwarchiwach.pl/54/771/0/6.1/63/skan/full/yD_N2CH4hl_7FF3PNvsoAg. 8“Akta stanu cywilnego Parafii Rzymskokatolickiej Kowalewo-Opactwo” (Kowalewo-Opactwo, Słupca, Wielkopolskie, Poland), “Ksiega urodzen, malzenstw, zgonów”, 1881, births, #15, record for Józefa Grzesiak, accessed in person at the archive by Zbigniew Krawczynski. ; Archiwum Państwowe w Poznaniu. Oddział w Koninie, 3 Maja 78 Konin, Poland. 9“Akta stanu cywilnego Parafii Rzymskokatolickiej Cienin Koscielny (pow. slupecki)”, Narodowe Archiwum Cyfrowe, Szukajwarchiwach (http://www.szukajwarchiwach.pl/), Ksiega urodzonych, malzenstw i zgonów, 1839, births, #4, record for Józef Grzesiak, accessed on 22 June 2016. http://www.szukajwarchiwach.pl/54/740/0/6.1/30/skan/full/hSeZeC8-TYbTYBA3GioEiA. 10Roman Catholic Church, Zagórów parish (Zagórów (Słupca), Poznań, Poland), Kopie księg metrykalnych, 1808-1947, 1843, Births, #31, record for Marianna Krawczyńska. ; 2162128 Item 1.